Richard Sherlock would rather be on the receiving end of a wealthy charity instead of in the middle of investigating the missing millions from one wealthy donor, but, as usual, he has no choice. The last thing Richmond Insurance wants to do is pay out on a six-million-dollar claim. 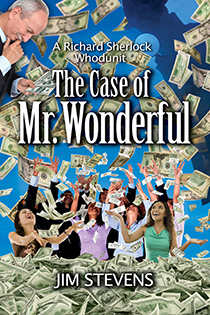 Sherlock is thrown knee-deep into oodles of free money, but can’t seem to pick up a dime for himself. Complicating matters are cutthroat, corporate conniving, his daughter dating, a new career calling, a botched burglary, Tiffany’s terrible tryst, and how to use used food. In the end, charity case Sherlock figures out the charity case. Make sure you sign up for Jim's Mailing List and receive the free short story The Case of the Missing Inkster.